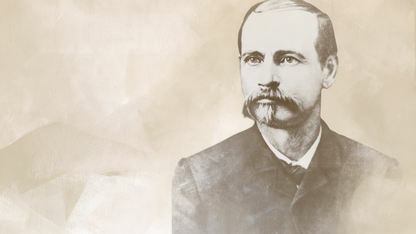 Born in 1845, William Guy resided in the Chickasaw Nation. He attended tribal schools until the outbreak of the Civil War. He then enlisted in the military and had a decorated career during the war. He fought in the Battle of Bull Run and Gettysburg. He was severely injured and taken prisoner after Gettysburg but released shortly thereafter in a prisoner exchange. After the war he returned to his home of Mississippi and resumed his education at Marshall Institute. Afterwards he rejoined his uncle, Cyrus Harris, at Mill Creek, Chickasaw Nation and worked in the stock business. In 1870 he was appointed secretary of the Chickasaw senate. Some years later, after his experience came to fruition, Guy ran for governor and won by one vote against William Byrd. Over the next few years Guy was defeated by Byrd, and he abdicated his role as governor. Afterwards he was elected to the Chickasaw senate, and served as a delegate for the Chickasaw Nation. Guy was a proponent of legislation that allowed mixed-blood Chickasaws to have rights and amenities that full-blooded Chickasaws were able to enjoy. Guy kept his interest in the political affairs of the Chickasaw Nation until it seemed the tribe was absorbed into the American way of life. He then retired and lived in Sulphur, Oklahoma, where he passed away in 1918.